You already know that a student’s excitement about your college leads to a far greater likelihood of enrollment. And, you probably know that college tours and campus visits can influence a student’s level of excitement about a particular institution. 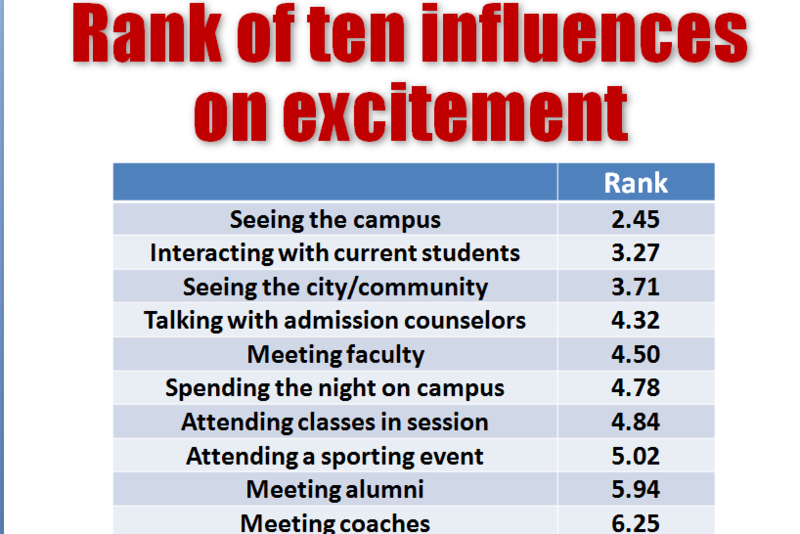 But, you might be surprised to learn exactly what does and does not create excitement during a campus visit. Recently, we asked 12,000 college-bound students to give us the scoop on campus tours and, frankly, we were shocked by what they told us. For instance, approximately 60% of students say that college campus tours are about the same in terms of generating excitement. Most don’t generate any more or less excitement than all of the others they experienced. In part, the reason for not generating excitement, students say, is the focus that the college places on itself rather than the student. This is especially so in group tours. In contrast, students who receive one-on-one tours where the focus is on them and what they want, tend to see the campus visit experience as a demonstration of the college’s personal interest in them. 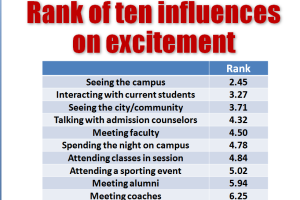 When asked to rank the order which factors are most influential in generating their excitement about a college, students rank “seeing the campus” as most influential. The importance of interacting with current students places second. This is a continuing refrain, as evidenced in other data uncovered in The Excitement Factor! (our latest national higher education study) about the power of current students as a draw for prospective students. Can you guess what ranked third? More influential than talking with counselors, meeting faculty, or even spending a night on campus or attending a sporting event? Seeing and experiencing the city and community in which they will live! That’s right, gaining a sense of the community and what it has to offer has a big impact on prospective students. It’s an important component in the total set of factors that will make up this new chapter of their lives. Lower number represents greater influence. The relative influence of the city/community suggests that colleges will be well served in their recruiting efforts by taking a hands-on approach to enabling students and parents to see and experience all that the city and community has to offer them, in much the same way as a campus tour is planned, organized and executed. How can you tap into this resource most effectively? We have compiled a few effective strategies for you to consider. Some universities actually have an online interactive tool that allows students to select the various types of restaurants, activities, shopping and sights they are most interested in experiencing. Once the selections are made, recommendations are made and directions, reservations and special offers are made available. If your college, like most, includes a community brochure in your welcome packet, it is time to take it up a notch. Ask retailers to include special offers for visiting students and their parents or to provide some local swag such as t-shirts, hats, cups, mugs, posters, etc. Your institution is an enormous player in the local economy and adds great status to your city. If you don’t already have a presence in the local chamber of commerce and downtown association perhaps now is the time to do so. Progressive chambers of commerce will welcome the opportunity to expose their membership to your influx of potential new “residents” and may be willing to host events, present city tours and provide key community players to interact with the students. Downtown associations and chambers have been known to organize street parties and welcome events during campus tour periods and to ensure that every establishment is decked out in welcome signage. Invite restaurants, retailers, attractions, and key businesses to be a part of the campus tour experience. Whether you make this a stand-alone event or integrate it into your standard tour, it can have big impact. Entertainment from local theme parks and attractions; demonstrations of anything from skateboarding to the rock climbing club; food samples from area restaurants, all designed to expose students to a selection of activities that represent your unique community is sure to generate excitement. These community partnerships needn’t be budget breakers either since the majority of cost will be borne by the businesses you work with. You’ll be offering priceless exposure to local businesses and creating excitement for the community AND your college or university. Most colleges survey students and parents after a visit. Were we friendly? Did we provide the information you needed? Was the tour guide engaging? Did you like our campus and community? What did you like most and least about your visit? What improvements can we make? These may seem like good questions but they don’t tell you much. Instead, ask questions that tell you whether your campus/community visit “moved the student’s needle” in your favor. Examples: Did your campus tour guide make you more or less excited about attending? If so, by how much? Why? Did you find the city/community more or less exciting and inviting than other colleges you visited? If so, what made it more or less exciting? To what degree do you feel we took a personal interest in you? Did that make a difference in your desire to enroll here? Did your view of our college change as a result of your visit? If so, how? For better or worse? How can we better show you what your life will be like as a student here? The best part: You will be differentiating your campus visits/tours from all others! Summer is the ideal time to train and motivate your staff. Email or call me if you are interested in how we can help you develop a powerhouse team of admission counselors, tour guides, student callers, and others on campus who impact your ability to recruit students. Because it’s connected with the topic of this post, you should know that we are launching a new higher education study (the latest is a very popular series) in which we will explore, in detail, how students form a relationship (or not) with the colleges they consider. 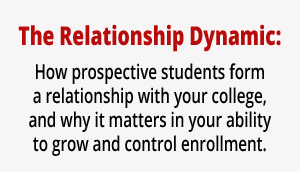 It’s called, The Relationship Dynamic: How prospective students form a relationship with your college, and why it matters in your ability to grow and control enrollment. You can get insight into how effectively you are building (or not building) relationships that will lead to enrollment. Enrollment Planners: Creating Excitement Will Drive Enrollment! I will be in Chicago this week to make an appearance at the ACT 30th Annual Enrollment Planners Conference. With a full day of pre-conference workshops followed by more than 60 practitioner-focused sessions and nationally known speakers addressing the latest topics in student recruitment and retention, the ACT Enrollment Planners conference is always a very rewarding professional development experience. This is sure to be an enlightening and thought-provoking session where we’ll present the findings and implications from a groundbreaking study, The Excitement Factor! The research revealed that a prospective student’s excitement about attending a college is more highly correlated to enrollment than either cost or the perceived quality of the institution. Purdue and University of Denver are two of the more than 40 colleges across the United States who cosponsored the study, which generated more than 13,000 respondents. We are looking forward to taking a deeper dive into the data that was uncovered in this study. 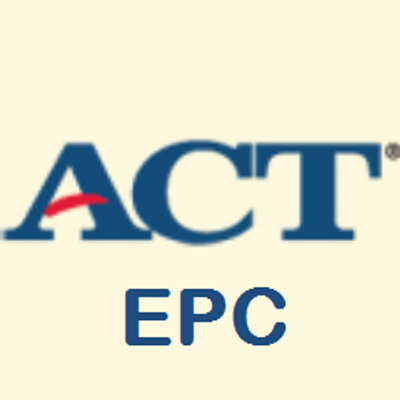 This is actionable information that will help enrollment professionals better understand the environments in which student excitement is created, the people on campus who create it, points in the recruiting cycle where it is most frequently created, and specific methods and messages that are most and least effective in creating a student’s excitement about your college. Most importantly, Cathy from Purdue and Rachel of the University of Denver, will be sharing specific strategies that any college or university can use today to increase the excitement factor and grow enrollment. Attending the ACT Enrollment Planners Conference? Join us Thursday, 9:45 – 10:45 a.m. in the Armitage Room on the 4th floor. If not, you can follow the conference on Twitter @ACTepc and #ACTEPC. 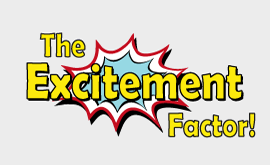 If you are interested in learning more about The Excitement Factor, you can DOWNLOAD the full report now. Or, better yet, call or email us and we will provide a comprehensive presentation of the data for you and your staff. We recently announced the launch of our new co-sponsored study, “The Relationship Dynamic: How prospective students form a relationship with your college, and why it matters in your ability to grow and control enrollment.” This study is a partnership of private and public colleges and universities from across the country seeking powerful data about building the types of relationships with prospective students that will lead to enrollment. CLICK HERE to learn more about getting involved in this new study. 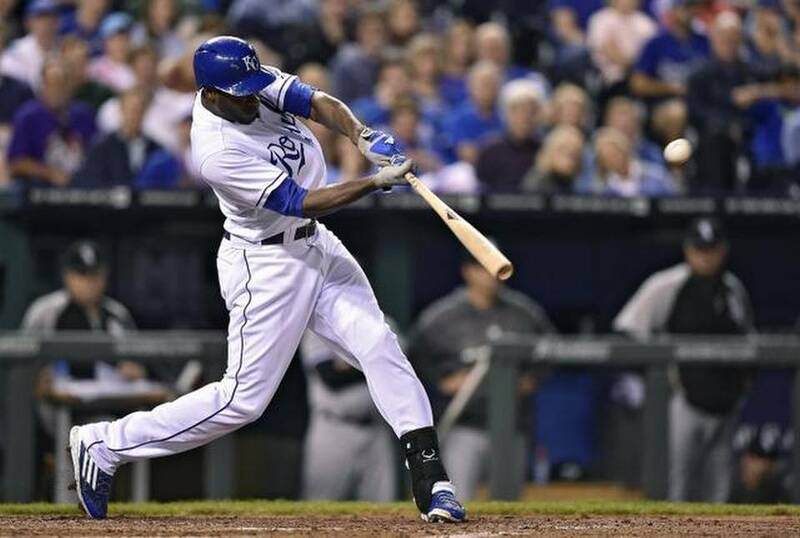 Make Every Appearance “At the Plate” a Winner! Is your admissions team ready to step up to the plate? Will they be hitting home runs or striking out? At Longmire and Company we believe that the conversations between prospective students and the institutions that they are considering can be much more productive and lead to a deeper, richer and more meaningful relationship that will be more fruitful for the student and for the college. At the heart of our highly-successful Interactive Counselor Training Program is a proven model of communication that counselors tell us is transformative. It is simple and effective. Adopt this straightforward method and you will see greater success in your recruitment efforts. By using this model properly, both you and the student will be better served because you will understand the individual student’s needs and preferences, and that will allow you to present the value of your institution in a way that will most resonate with THAT student. While the model may be simple, your skill in executing it makes all the difference. Swinging a bat is simple. Great execution makes for batting champions. The answer to increasing enrollment in the face of the many challenges in higher education today lies in taking an entirely student-centric approach to recruiting where the admission office and counselors realize that “it’s not about the institution – it’s about the student.” This is powerful when put into practice. Through our Interactive Counselor Training Workshops, we spend a great deal of time changing the focus of admission counselors. We see their transformation and improvements in productivity. Most importantly, we see changes in the recruiting process that exposes students to the information and experiences that truly interest and excite them.